As it states, this book can be read as a standalone, though it is a sequel. I read it as the first book and I must say, it is completely true. I never felt lost or as though I had missed important details. I loved the book and am actually keen, not only to read the rest of the series, but also to pop back and read the first book. I want to know all the details about how they became what they are.This book really is the perfect match for Percy fans and those who have read Paul Durham’s books. It is written in a way that it appeals to us adults, but it also riveting for YAs as well. I found myself unable to book the book, well my iPad, down. I was drawn into the perfectly created characters and the great blend of action, sci-fi and adrenaline. These kids are real heroes and they have only just started to realise their potential. I can’t wait to see where it takes them in future books.I found that the characters were really well written. They have great personalities, which are strong and light-hearted enough to get them through the fact that they cannot remember what happened in the last year. As they gain those memories, they become even stronger, more courageous and the depth of their intellect starts to show. I like reading as they interact both with each other and with those around them, as I really think they are created as great people.I loved the pace of this book. It is perfect of YAs – action-packed, fast-paced, but with enough detail to give them something to really get into and latch onto. I can see this series swiftly becoming a favourite among that age group. I also think the pace does a lot for adults. Though the story doesn’t have as many intricate details as some sci-fi, adult reads would, it doesn’t lack in great action and well-written storyline.Overall, I was very impressed with this read. As mentioned, I plan to read the rest of the series and do hop to pop back and read the first book. I really want to see how they became what they are. I highly recommend this to fans of the above mentioned and for young readers who like action and suspense, mixed with a bit of fantasy and sci-fi. 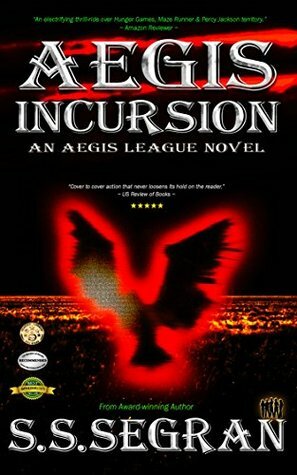 AEGIS INCURSION is an Action Adventure / Fantasy story by S. S. Segran that was recommended to me; it is the second book of the Aegis League Series Book 2. I asked a few other readers regarding the book as I had not read the prior title and it is one of the rare few that works good as a stand-alone story.While it is geared for the Teen / Young Adult audience it was still a very good book for an adult that enjoys Action Adventure / Fantasy story that is part paranormal, part magic and one that pits good versus evil.It is not a particularly sophisticated book (because it is written for that Young Adult audience) but it is involved and well written enough where it is NOT simple / boring; it will keep you engaged throughout the entire story.Additionally, because it is a Young Adult read, it isn't laced with profanity or other heavy adult themes.Now that I am done with it I am going to put it on the list for my eleven year old to read. The adventure continues, will the cost become to high? Will winning be worth it, or will a loss be better then the alternative?This review is from: AEGIS INCURSION (Teen/YA - Action Adventure, Fantasy) (The Aegis League Series Book 2) (Kindle Edition)This young Author continues to impress and build her characters and her story lines further out into the world to encompass issues and themes that can resonate more and more. These books become the ones that you recommend and pass on to the next generation. You learn in the first book that 5 average teens are anything but average, foretold in an ancient prophesy to save the world from a dark danger. Jag, Aari,and Kody the boys, and Tegan and Mariah the girls have started their training, and you expect them to have been training in the year they have been home. Not so fast.The kids memories of their time in the village in the Yukon training and fighting along side the people that are descendants of the combination between, a mysterious advanced civilization refugees and a more primitive village population. The teens while battle proven are sent back home with their memories clouded as to what they had done. They don't train, they don't even spend as much time together as they had before. Suddenly as they start a road trip to try to bring them back together the way they had been they begin having dreams.Talking they become aware they are the same dream just from each of their own perspective. They slowly remember their skills and when attacked with a cloud bomb the memories come rushing back. On the heels of the memories they also become aware of a new global threat to the food supply and the dark cabal they had faced in the Yukon is behind this new threat. With the assistance of a mouse, a farm Labrador and a dragon fly! These teens use their brains and those devoted to help them stop the danger in America and help the sentries around the world, but the main leader of the Cabal of evil is still out there, and while taken down with some losses they are still left with fighting one that would be a rival of the Elders that taught them and he is aware of them, they haven't gotten close to him yet. That battle is down the road and will be a defining battle of good and evil.This book is great for tweens, teens and young adults, I highly recommend it for gifts, and yea even those of us over 50 can enjoy the page turning drama and action. You feel mad that a teen gets kidnapped twice in one week by the same guy they had trusted. The mousecapades and dragonfly flights are wonderful and entertaining. The fact that as the book closes the teens parents are about to meet an Elder is a very big deal..the question is will it become a deal breaker? Will the parents support the fight or will there be division? This battle has already cost one family the beloved Grandmother, at what point does the family say the price is too high! Your life is at stake! Where do the Kids become the adults and say it is a fight we have to take on, sorry Mom and Dad but I can't stop?Good vs Evil is a battle that is everywhere, do we see it when it's a mob mentality looting a store as much as a evil plot to destroy crops? We need to step in and say NO when it's the local store as much as when it's the planet. Take a stand and not allow your mind to become brainwashed by evil looking to get a toe hold. It's a hard battle, and one that these kids are willing to fight, but they are impulsive and are coming to grips with the cost.I eagerly await the next installment of this series, it is one that I recommend to all readers. You take away from it some of the most basic principals, how to live with your choices, and when to fight against control. This sequel to Aegis Rising is even better than the first book. The story follows five teenagers on a road trip from their home in Montana to California. But these aren't five ordinary teens. The year before they had crash landed in a plane in northern British Columbia and taken in by an isolated native tribe, hailed as the answer to an age old prophecy. The natives trained them in the first book, and they developed some special skills, powers if you will. They helped the natives overcome a deadly enemy and then were returned home, but with amnesia about the events of their summer.In this sequel, the five's memories are re-wakened as they are called on to battle a ruthless power that has been affecting crops around the world, causing food shortages and riots. The reason for this group's actions is shrouded in mystery but they believe they are benefactors to mankind. (The road to hell is paved with good intentions, they say.) Without spoiling the story, I can say that our heroes save the day, but it is a temporary reprieve and sets up nicely for the third book in the quintology. (Which has not been written yet. )The teens are a clever, talented bunch with engaging personalities. The story moves along quickly with lots of challenges facing the teens as they fight to stop the devastation of the crops. The story is more science fictiony than the first one with the mysterious enemy employing high-tech nanomites (microscopic robots), a particularly nasty enemy for the teens to fight. There are lots of thrills including a chase involving a giant mining truck. All in all, an engaging, fast-paced and exciting read. Looking forward to the final book in the series. And the GOOD FIGHT continues....I have read both books now. And the GOOD fight will continue in book number three. This is a good clean book, for ALL ages. There is mystery, of what is going on, what is coming next. There is action, of how the kids will handle the bad guys. It also makes you think about what could happen to the world if things were to happen the way it does in the book. And what kind of person would you be, if it did. I would recommend this book. awesome!I have to start by saying that I received this book free in exchange for an honest review. I have no trouble with that because this book is amazing!! The story line draws the reader in and is terrifying that the events could take place. The Five work so well together and are great friends as well as a team. I can NOT wait for the next installment. Excellent book. I have discovered that some sequels aren't as good as the original. That is not the case with this sequel. "Aegis Incursion" is just as exciting an adventure as the first. It is definitely a worthy successor. Looking forward to the next book in the series. Thanks for a wonderful seriesAction heroes are not just adults any more. If we like all the adult heroes we should love these kids. Using powers that they developed by hard work and trial they face and odds and win. A great story and waiting for the next book. Okay, so I did not read the first book. I was told this could be read as a stand alone book, and they weren't kidding. Absolutely no mis-step in getting into the story whatsoever.Wow! What an incredibly imaginative story…very scientific in theory, I'm wondering if the author has some kind of background in physics or something? If not, she surly did her research, just the little nanomites alone are something else. And then of course there's all the supernatural excitement included, so this makes for a really fun read.The book is fast paced and a challenge to put down once you get rolling, very easy to follow along with the story, no confusions, yay. Very visual, super action packed! The main characters, the kids, are wonderfully crafted individuals, great distinctive personalities…they are believable and enjoyable to picture…even if they are modern day super-heros! Like I said, I believed their stories…very well done. The one thing that bugged me, and this is me being me, is in the beginning the author would use the term, "the five" incessantly…literally, several times in a paragraph. Even when it was obvious that no one else was involved in the scene but the teens, she would say "the five". Instead of saying, "they all walked outside", it was always, the five walked outside, the five sat down, the five looked at each other. It really annoyed me for a while, then it seemed to diminish as the story went on..thank goodness. So unless I'm unaware of the fact that they are known as "the Five", like the X-Men or something, and I missed this "title"..then of course I apologize and take it all back…otherwise it just bugged me for a while…and if I'm being totally honest, a couple of the "other-worldy" names were very difficult to pronounce and sometimes slowed me down when I was on a roll, attempting to figure out how to hear their names in my head. However, this did not bother to the detriment of the story in the least.Needless to say, I'm absolutely eager to get to the next installment to see where our heroes end up…oh! and it looks like I'll go back and read the first book in the series to get the actual background of the story…however, that's just for something else to read, not because it's necessary to enjoy this book. Well done SS Segran! A book not to be missed! A great sequel to the first book, Aegis Rising!This book is well thought out and well written. Loved every minute of it. It was also insightful in terms of learning about advanced technology and its scary to think how that could be used against human existence. Aegis Incursion kept me on the edge of my seat. It was filled with many nail-biting moments and was action packed that I wish it was a movie I'm watching. Perhaps one day it will be! Besides the action and suspense, there were some tender and emotional moments that were thought provoking which shows the authors versatility in writing. I laughed, cried, feared and had a great mix of emotions reading this book. It definitely was a full experience! I highly recommend it! The Next BIG YA Series! I couldn’t put this book down. The pacing is tight, the plot is gripping and it has interesting twists and turns that make you go whoa! And the action, OMG! Definitely one of the best sequels ever for any series, period! It’s got so many different strands that the author expertly brings to a heart-pounding convergence. And to see the way the Five teens have grown is truly astounding. Can’t wait for Book Three! Kudos to S.S.Segran! Thank you for giving this reader an adventure, sci-fi story that will be remembered for a long time. Actual rating: 3.5 out of 5Readers, note that you don't need to have read the first Aegis League novel to fully appreciate this one - this story does entirely stand alone. While this may be frustrating for followers of the series, it does allow newcomers to be rapidly brought up to speed.I thought that this was a definite improvement on the first book. The story flowed a lot better, reintroducing the principle five characters and their abilities while interspersing their development with some very exciting sequences. It was a very easy read and I devoured the first half of the story in just a couple of hours. The series still carries a very environmental and can be a little heavy-handed in its approach at times but does provide an interesting angle on issues with world agriculture and just how far reaching a food crisis would be. While the plot did make me curious, it should be noted that little is resolved in this volume. The heroes remain ignorant of the villain's grand plan as the series is apparently intended to run for a further three novels.I did feel that it started to drag over its second half. The book felt longer than it needed to be and a lot of that was given over to repetition and over elaborate details. Segran has a habit of describing every single character movement which did become a little tiring after a while.Yet the characterisation had drastically improved. In Aegis Rising, I had trouble telling the teens apart but now they have noticeably different personalities. While I still felt that some had more development than others (Mariah is probably the weakest of the lot, while Jag gets a whole lot of backstory in this volume), it's nice to see that the author has fleshed them out into more realistic teenagers. The villains also had more motivation this time around and didn't just exist to be evil.All in all, I was pleasantly surprised. I'm very interested to see how Segran's skill will increase as she continues the series. AEGIS INCURSION is the second book in the Aegis League series. Since I haven't read the first book, I was a bit nervous with throwing myself neck-deep into this unfamiliar apocalyptic meets Elders-of-an-ancient-tribe world, but the author did a great job at bringing a new reader up to speed.In neat, short, well-paced chapters, we are introduced to the main ensemble cast consisting of five teenagers: the Geeky Aari, the Always-Hungry Kody, the Daring Jag, the Touchy Tegan, and the Observing Mariah. They are all introduced one by one through their POV chapters, focusing on their traits, attitudes and personal history allowing to connect to each of them as an individual, not just a mere component of a larger team.We are told the five teenagers have lost their memory of a period of time from the previous summer (details of that adventure in Book 1). A year came and went, and our guys still haven't made peace with what might have happened during that perilous summer . . . So they decide to go on a road trip as a means of leaving it all behind.From there on, the plot can be summarized as the following: driving, driving, ACTION! Driving, ACTION!! action while driving, then driving, another action, more driving, another action while driving, farm house, driving . . . Somewhere in between or during those events we have nightmares, kidnappings, a crazy figure who wants to destroy most of the world to create a new utopia, food shortages, civil unrest . . . If you liked the Hunger Games or the Divergent Series then you will really love this series of books. Each one is good on its own, but as a series they are great. I was holding my breath through most of the book. The action is almost non stop and often leaves you breathless. There are times that I had to stop reading for a few minutes to just take a breath. The characters are totally believable and there are times when they seem like super heroes and then they go and remind you that they really are just teenagers with a heavy burden on their shoulders. Without giving anything away suffice it to say they do a great job at what they are asked to do. I can't wait for book three. This is the second book in the Aegis League series. While it helps to have read the first book in the series, the author does a good job at bringing a new reader up to speed. You have 5 teenagers who lost their memory of a period of time from the previous summer (details of that adventure in Book 1). Add in a new adventure this summer, nightmares, kidnappings, a maniacal figure who wants to destroy most of the world to create a new utopia, food shortages, civil unrest, and you have the makings of a book that is hard to put down. Even better than Book One. Very impressive young author with a unique and engaging YA series unlike anything out there. I see a great future for this author in the vein on JK Rowling, Suzanne Collins. & James Dashner. The writing is very descriptive, the action heart- pounding and the characters engaging. Highly recommended for young adults and adults alike. This book can be read as a standalone. Excellent sequel to Aegis Rising Too often the second book in a series falls down, but not so in this case! Aegis Incursion is a perfect example of what a sequel should be - expanding on the story line, developing more depth in the characters and an ending that leaves you anxious for book three to hit the shelves.I, for one, can't wait to see where she goes next. Although the second in a series, I felt this could stand on its own. Targeted for young adults, I think fantasy-minded adults like myself will enjoy it. S.S. Segran is a talented author with promise. Great book by S.S. Segran. I can not wait until the next one comes out. Will there be more than three in the series? This one, like the first was very hard to put down. We are proud to announce that AEGIS INCURSION by S.S. Segran is a B.R.A.G. Medallion Honoree. This tells a reader that this book is well worth their time and money! Aegis Incursion is the second book in The Aegis League series by S.S. Segran. In the first book, Aegis Rising, we follow the adventures of a group of five teenagers whose plane has crash landed in Dema-Ki, the hidden valley. With the help of villagers, they learn new powers. However, in Aegis Incursion, it's months after they've returned to their homes. Yet, they've lost their memories of what has happened. Crops are dying all over the world and, on a road trip, the five find that they might be of some use to help their fellow citizens.In the prologue, we travel to Lake Mead in Nevada. I really found it to be an interest beginning with the plane crash and Elwood seemed like a really interesting character. I loved how he felt he needed to impress Rosemary. However, we saw very little of him afterward, which was such a disappointment. To go on with the main book, the plot from the very beginning of the book, seemed like a repeat of the first; both feature the poisoning or destruction of areas due to the scientific work of a group. To go along with that, both times, the five must find their powers and it seems like they're the only ones who are able to save the day by the end of the book. Yet again, we get mention of some sort of accident which Jag was involved with, even meeting the victim, Roderick who is wheelchair bound. Yet, we have no real explanation of it. Both books have made mention to it, but in neither have we received a proper explanation to it. The bullying of the five was really unnecessary. Firstly, I don't see why anyone would bother bullying them. It seems like it's because of their amnesia, but it's not an interesting enough thing to bully them about. It's just poor writing and I can't figure out what the author's intention was with the scenes in school. They didn't introduce any decent information and nor did they properly explain the events of the first book, so it was essentially a completely unnecessary portion to the book. Furthermore, so many children experience bullying these days. Yet, the moral that the author is trying to portray is to run away from it. None of these five try to deal with it properly. On that note, there's a lot of bullying between the five. Aari is mocked for simply getting his laptop out of his bag, the others referring to him as "Captain Geek". Throughout the novel, they bully him because he takes an interest in science and generally knows more than they do in some topics. In the last book, Kody was bullied very often for eating a lot, which continues in this book also. Consistently, through both novels, he gets mocked that he's always thinking with his stomach. To add "humour" and to lighten the mood, the author often has Kody suggesting that they have something to eat when times get tough. It's just not funny or amusing at all, but it's something the author does so often and I don't think they realise how nasty they have other characters acting towards him. For all the ways they think they need a holiday, none of them really seems interested in enjoying the experience. Every single place they go and everything they do, there's just one complaint after another. It just makes them look like really miserable people, trying to make each other miserable as well.The road trip is really hyped up by everyone in the book, but it just seems really lame to me. They're not on the trip long, admittedly, but all they seem to do in the car is listen to music and chat. They can do that at home. Yet, the five keep on making comments "we need this". You need it for what? Their lives really aren't so difficult. Sure, they went through some incredible stuff in the first book, but ultimately they can't remember it anyway. The incident with the smoke canister only really seems like it's just to make us feel sorry for them and provide further reason to sight see; "we really needed this after what happened yesterday." In fact, I think that the five all experiencing amnesia was just a tacky portion of the plot. It didn't serve a proper purpose and, in the end, it still wasn't properly explained. The explanation that is later given is that it was so the five's powers would be "undisclosed" to the world. Why bother? They regained their memories and powers within the year. It would have been more practical to simply ask them not to brag and get the five to understand that they should remain quiet on the matter. The thing with the nightmares was badly done as well; it just seemed like an awkward way to use the final battle of the last book as some sort of major portion of this one, when it just had no real place.I am beginning to think that the five are seriously kind of... stupid. They often seem to lack basic common sense. My first point on this is when they're relearning their powers after the amnesia. They've saved the surfer and they all begin talking about their powers. In public! Later on, they've practiced their powers and they continue to try and show them off in public, with further discussion on them. The whole idea of their memory wipes were so that they wouldn't disclose it to the world. Ironically, that's the first thing they do when recovering from them. They talk and actively practice their powers in public places, even brag about them to Tony. Not to mention, why the heck would they tell Tony? They've only known him a few days, he's obviously suspicious and there was no reason to talk to him about it. The author just makes some of them ignorant about fighting as well. Obviously I'm not an expert, in such things, but some of the characters completely disregard reasonable ways to fight just because they hadn't thought of it. At one point, the girls (while they were being held prisoner) had been fed a sandwich on a paper plate. Tegan ridicules the paper plate that it would not be of any use in a fight. Yet, she (and the author) is completely disregarding the use it can be as a weapon. It could easily damage a person's eyes if they manage to hit the captor in the right place. Also, since paper plates are generally cardboard and not paper, it could be formed to make a version of brass knuckles, which would also provide a hand with a little bit of protection in a punch, as well as doing the damage to the victim. Another consideration I have about this is that, at no point in time did they bother calling the police. The first time they ought to have done it is when the gas canister was used against them. Firstly, they ought to have pressed charges. Secondly, they should have had some sort of medical technician look them over; they had no idea what was really in the canister and, for all they knew, it could have been something really dangerous. It just seems absurd that none of them even considered going to get checked out by a doctor after such an event, which was obviously not a practical joke. Later on, multiple times, several of them are kidnapped. Several times they're shot at and even one of the party does get shot. Yet, none of them make reports with the police. Even the one of them who had been shot refuses medical attention, believing that his own medicine is much more practical than a doctor could provide... Furthermore, after being kidnapped and escaping, once getting to a phone, the character decides to phone another of the five rather than calling the police. When they find what's been destroying the crops, no-one bothers reporting what they saw to the authorities and what they know about it. After their kidnappings, they do have a reasonable amount of knowledge about the organisation perpetrating the events, but they don't bother disclosing that information to the authorities. I just can't understand these characters. Throughout the novel, their intelligence just seems to be dropping and I've pretty much lost any respect for them. They have no common sense and make utterly stupid decisions.None of the new characters are very interesting. They essentially seem like carbon copies of old characters. Anthony/ Tony is just completely absurd. I just don't understand why the five are so quick to trust him. He's obviously suspicious; the fact that he's pretty much following them everywhere. His storyline is essentially the same as Hutar's in the first book; he pretended to be their friend for the purpose of getting close to them and gaining information, then he betrayed them. One character mentions something along the lines of, "he played us so well. Nobody saw it coming." Of course we did 'cause it was so *beeping* obvious! He follows you around a bunch, just *happening* to appear at all sorts of restaurants and places you visit... How could they not realise? I mean, it's just so painfully obvious!! Also, why the heck would he use his real name with the teenagers? The author doesn't really have unique descriptions of people either. Marshall is originally referred to as a blond Hugh Jackman. Another guy, Liam, later is referred to as an Australian Elvis Presley. The relatives of the five are pretty dull as well. They are all exactly alike; they're nice, respectful and all care deeply for the five. It's just so unbelievable and just seems really fake. Yet, all these parents clamour together and pity the five at great length because "they've been through so much(!)" and "they really need this road trip(! )", yet it's really repetitive. Like I said in my review for the first book, the author doesn't really bother writing original characters; even in this book as well, we only have the "good" characters and the "bad" characters. Even with the "unique" touches the author tries to add, we just end up with characters that are just really stereotypical.Overall, the book was just a mess. The author writes well. However, in both books, they've had completely dull characters with a cliché plot. The characters make terrible decisions, lack basic common sense and the overall book is just so overly dramatic when the situations aren't as bad as the author makes it out to be. I'm pretty unimpressed with this book. I will not likely read the next one in the series. If I were to read it, I certainly wouldn't want to pay for it. To be honest, I'm pretty glad that I didn't have to pay for these first two novels as I obtained them both for free on Amazon.com.au. I rated the last book three stars, though was considering a two. I definitely don't think this is worth anymore than two; I admit that I like the author's writing style, but none of the characters are even remotely interesting (and the two I have enjoyed out of both books are pretty much both thrown away after the prologues) and the plot of both (they're the same, there's no denying it) is just so generic. This is the second book in the series and takes over with the 5 friends returned home, but with no memory whatsoever of the previous 3 months. They have had the rest of the school year being made fun of and need some together time to recover and get their mojo as friends back.They spent the term planning a road trip to California and set off once school is over. The start of the trip is fairly normal with just Jag having bad dreams, which he has been having since he returned homeThe prophecy the Elders had told them about, when they were in the hidden village, is coming true and the time for the ‘Five’ is coming sooner than thought. Their trip gets interrupted and they encounter a couple of different people. One is there to help them and is a Sentry, sent by the Elders, the other is part of the evil plan that has been put into action.Crops are dying off all around the world and this is just part of the disaster awaiting the world. Food is getting scare, riots are breaking out and wars may be started. It us up to the ‘Five’ to figure out what is happening and try to find something, long thought lost, to combat the destruction happening in the USA and across the world.The ‘Five’ have people chasing after them, to kidnap them, to find out the secrets of their powers and about the hidden village. Can the ‘Five’ manage to avoid them and stay safe whilst also having to find a solution? Help from some Sentries, a bit of luck and good teamwork, memories to return, powers to develop and the help of the Elders should assist the ‘Five’ to overcome the evil order.We see some difficulties being faced by our young heroes and they will find out that they are stronger together than apart. Lots of action takes place in this book and we get to learn more about their families and interactions. Problems to be solved and out of the box solutions are required. The government can’t solve the destruction of crops and aren’t very effective at stopping food riots. Talk is of wars starting as countries across the world start to fall apart.This was a fantastic book, I thought the first book was great, but this raises the bar to a whole new level! The chosen ‘Five’ are well developed characters and easy to like and cheer for. The idea of light working over darkness brings to mind the saying that all it takes for evil to triumph is for good men to do nothing. Leave yourself a good weekend at least to read this, you probably won’t want to stop.I was lucky enough to be given a copy of the book by the author and I have freely given my own opinion of the book above. I can’t wait for the next book in the series, Aegis Evolution, to be out. Loving them! Cant wait for the next one'sEveryone who likes science friction this the series for them. I could not stop reading until the end. What a good read. I picked this book mainly because I was intrigued by the idea that part of the story was based in my childhood stomping grounds. Picking it based on that was a HUGE mistake. I couldn't enjoy the story because I was so mad about all the mistakes.Let's start with the beginning. July on Lake Mead is HOT. And the idea that a boy is trying to get his first fish of the season is ridiculous. I could see April, but not July. Secondly, there are no town's near enough that he could run somewhere for help. If he was indeed from Overton, as the book implies, it takes 20 minutes to drive to the nearest dock from town. He couldn't run that far. And the farms were in town, not at the lake. Plus, where the plane sunk is not even remotely close to where a boy, even a teenage boy, could canoe out to, and back, in any short amount of time.Echo Bay is at least half an hour's drive from Overton. The idea that they arrived in Overton 30 minutes ago and are suddenly in Echo Bay is ludicrous.Next, someone shooting 500 feet or more from one boat to another is not going to be as accurate a shot as the author claimed.Plus, the Echo Bay Resort building is hundreds of feet from the water, so the boat hitting the fuel station on the water would not ignite the building.There are no bushes big enough or tall enough to hide three people along the dock either. It's the desert.St. Thomas is at the lake, so why would the landscape be suddenly different?Lake Mead is desert. There are no town's close enough for the timelines to work. It was very frustrating to me to read they were at cross streets so quickly, knowing there is NOTHING out there!Now, let's talk about Overton itself. There has not been an open motel there to the author's specifications in years. And even that one was only open for a year or two in the early 2000's.And getting takeout??? Please! Unless McDonalds suddenly started to deliver, which they don't. The only other restraunts are two Mom-and-Pop-like-dives, and they don't deliver.The woman's Victorian house with a full flowering garden and well maintained yard is pure fantasy. This is the desert. Flowers bloom in April, not July. There are water restrictions, especially in the time frame she gave for the story. And they most definitely would NOT have had tea in July. Lemonade, maybe, but not tea.And any local knows that St. Thomas was settled on the Muddy river, not the Colorado. The Colorado is literally miles and miles from St. Thomas, so having a local say it was on the Colorado is pure crap.Pawn shops? In Overton? Psh! The guy would have to go to Vegas. And the idea he could swim down to St. Thomas and find a well without diving gear is ridiculous. It's murky, muddy water, and the town was at least 30 feet if not 50 in the time frame given.Also, having the guy die in Vietnam...even if he was 12 , he would still have been close to 50. So unless he joined the air force at a young age and stayed in it, he wouldn't have gone. Plus, by the time Vietnam came around, he could have had grandkids, so no kids is a little far-fetched.The nearest express courier would be Mesquite, Henderson, Boulder City, or Las Vegas. Overton has a Post Office, period.Boulder City is an hour- hour and a half drive from St. Thomas. It would have been a long drive to find a cross street.And the iron peg to hold a rope so the Sentry could climb in a well....that made me laugh so hard! They would have to drive that peg pretty far down to get it to stay, we're talking 3-4 feet minimum. And the wells are so far apart, they would have to move the peg every time.Lastly, the cordless saw the kids use to cut open the side of the building...No way would that thing be quiet. EVER! It's a saw! Even cordless saws are noisy cutting through that much siding, sheetrock, and wood. And where is the ventilation for this underground generator? And how long would they really leave it without needing to fill the tank?There are just so many inconsistencies that I have a hard time believing this book could even remotely be plausible. I really wanted to like it, but I can't. And it made me wonder how much else she got wrong. I've been through Lima, MT several times, and there could be a sub shop as she claimed, but it is still a very small town in the middle of no where.I also thought the characters were rather flat. And maybe it was because it jumped around so much, but I didn't really like any of them. The end also felt rushed to me.All in all, She didn't do her research, and even though it is fiction, if you're going to use actual places and occurrences, you still need to do your research. Two stars is generous in my opinion right now.For my clean readers:There is limited swearing, and minor violence. Sequels are often harder to write than the original and often don't live up to expectations. Thankfully with Aegis Incursion, author S.S. Segran adds to the Aegis saga with a flair for description, whether it's of fishing or aviation, and the easy to read prose never gets in the way of a briskly paced plot.It's tempting to guess the baddies early on. The relationships between the teenagers on their road trip are both dynamic and comfortable. Our protagonists are rarely out of danger and their adventure is near impossible to put down.S.S. Segran employs contrasting settings (caverns, desert treks and jungles) to great effect which reflect the twist and turns the characters face. We also hear their internal thoughts which adds a new dimension without being cumbersome. Strong female characters (such as Tegan) and adults who are written in a non-condescending manner also are a refreshing change. There is an internal logic with the science presented which comes to the fore in this sequel. While there is a sense of joviality between the teens, a stronger hint of romance, angst and despondency may ground the characters a little more in reality and would be welcome for future volumes (teenagers can't jump from one adventurous scenario to the next without some downtime and pause for reflection).Aegis Incursion expands what has gone before in Aegis Rising and will have you waiting for Book 3! I has been a year since book 1 and we find Jag, Kody, Mariah, Tegan and Aari doing their own things. Although they had been trained, worked together, and developed abilities they had their memories clouded so they don’t remember any of this. They have drifted apart and decide to go on a trip to be closer like they used to be. There is a group that has been affecting the crops of the world and the kids have a run in with them that brings all their memories back. It is now up to the kids to fight for humanity and stop the nanomites that have been released. I really liked this book. I admit that I have not read the first book in the series but that didn’t matter. I had no trouble keeping up with the happenings, this could be a stand-alone book. There is a great story with lots of actions and adventure. I got wrapped up in this book and had a hard time putting it down. And the destruction of crops for the greater good, creepy if something like that actually happened and written in a way that I could feel the possibilities.I will be eagerly waiting the next book in the Aegis League series but in the mean time I will make sure to read Aegis Rising to catch up with what I have missed. I received Aegis Incursion for free from the Reading Addiction Virtual Book Tours in exchange for an honest review. Second in a series so I came in late do to speak, but was still able to follow this tale of 5 high school aged young people who having survived a plane crash and being missing for weeks, reappear seemingly now worse for wear, but remembering nothing of what happened while they were missing. Setting of on a road trip after their senior year they soon encounter some strange occurrences and find themselves going headlong into danger while there missing memories start to reemerge and they discover some unusual talents. They are soon embroiled in a fight against and organization intent on destroying grain crops world wide in order to foment chaos to further their plans. Action, suspense keep the story moving. Possibly geared more to the YA market but readable.